It’s a terrible day for the government, but a good day for Fianna Fáil, Sinn Féin and others. THE BOXES ARE open and the votes are being tallied in count centres all over the country, but already two exit polls have given us a strong indication of the nation’s verdict. The coalition is down, Fianna Fáil and Sinn Féin are up and new parties, small parties and independents have all performed well. So what are we to make of it all? Here’s what we can say so far. For all the economic growth and falling unemployment, the country seems to have solidly decided that it does just not like this government and has chosen not to re-elect it. To paraphrase Enda Kenny, Fine Gael and Labour have taken a wallop at the ballot box. The anger towards Fianna Fáil has subsided considerably but the country is not ready to forgive the party just yet. Overall, given the several different ways the vote has split, the buzzword is ‘fractured’. 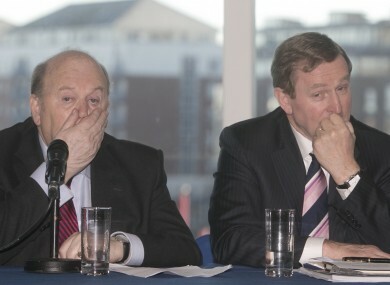 There is genuine shock in Fine Gael at the two exit polls which show the party performing far worse than it expected. TDs are already privately speculating about the future of leader Enda Kenny. A poor campaign delivered no momentum whatsoever and, in fact, Fine Gael seemed to go backwards over the last three weeks. Its 26% rating is worse than even the final opinion polls which had the party averaging 30%. All over the country, all but a handful of incumbent TDs now fear for their seats as a result of a vote management strategy where the party had tried to gets its second candidates elected. It might result in the vote splitting in many places and no one from Fine Gael getting elected. There was always an expectation that the shy Fianna Fáil voter would come out on election day and this appears to have happened. The party is on course to achieve close to 40 seats, a doubling of its 2011 take. This is off the back of a strong campaign where leader Micheál Martin put in an exceptional performance. The party will take seats where even it believed it only had an outside chance. The question for Fianna Fáil now is what it does with this result. The only viable coalition government based on the exit polls is Fine Gael and Fianna Fáil. If they can’t do a deal, how will the electorate respond to both parties if a second election is needed? Not well, we suspect. Despite what the party kept insisting, this was always going to be a bad day for Labour and so it has transpired. The result is on a par with the 7% the party achieved in the 2014 local elections and will make Joan Burton’s position, irrespective of whether she holds her seat or not, untenable. Some big names, including sitting ministers, are likely to lose their seats and it’s unthinkable that the party will go back into government with such a low number of TDs. In previous elections, Sinn Féin has not performed as well as the opinion polls indicated. That may not be the case this time around and the party may be on course to double the 14 seats it won in 2011, based on the 16% the RTÉ exit poll has forecast. One cautionary note is that the party has not performed as well – 10% – on second preferences which indicates that it continues to have a problem when it comes to transferability. But you can expect Gerry Adams and co to hail this as historic day for Sinn Féin. The Green Party and the Social Democrats seem to be the big winners among the smaller parties. The Greens in particular look set to secure State funding which they lost in 2011 and party leader Eamon Ryan could be among those to take a seat. The SocDems look set to win more than their current three TDs. There’s less good news for Renua with party leader Lucinda Creighton in a dogfight for her own seat in Dublin Bay South. The Anti-Austerity Alliance-People Before Profit grouping appears to be on course for a good day and could secure the crucial 7 Dáil seats it would need for speaking rights. The decision to unite the two parties raised eyebrows before the election, but it may pay-off when it comes to the result. Independents have also had a good day with early indications that the likes of Christy Burke could be in with a chance of a seat. Many of the sitting independent TDs look set to return to the 32nd Dáil and there will, undoubtedly, be some new faces too. Email “Coalition rejected and 6 other things we already know about this election”. Feedback on “Coalition rejected and 6 other things we already know about this election”.